It's officially Microsoft Office Word Templates week here at The Dynamics GP Blogster! 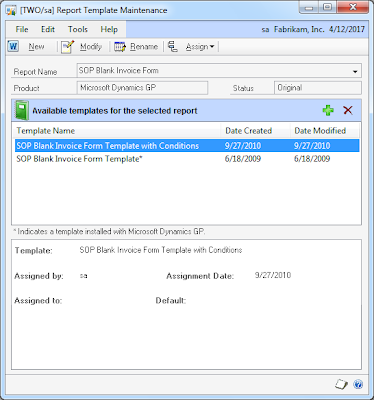 With the integration of Microsoft Word Templates into Microsoft Dynamics GP 2010, the possibilities of delivering professional looking business facing documents increased 1000-fold. Now, Microsoft Dynamics GP users want to take full advantage of Word's editing and document formating capabilities to introduce extra information in their business facing documents that was simply quite complex or impossible to achieve with Report Writer. 1. 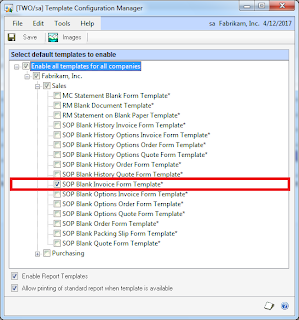 If you haven't done so, enable the SOP Blank Invoice Form Template* report under the Template Configuration Manager window. Click Save to continue. 2. 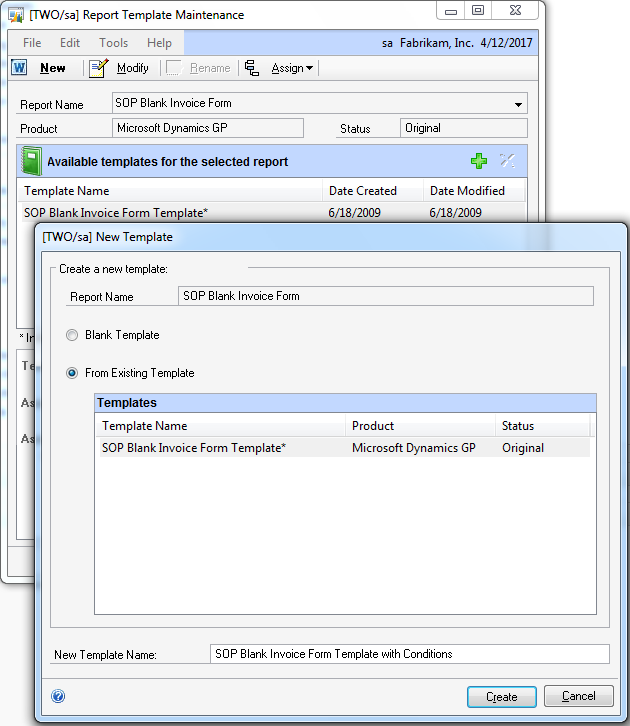 Open the Report Template Maintenance window and choose the SOP Blank Invoice Form from the More Reports option. 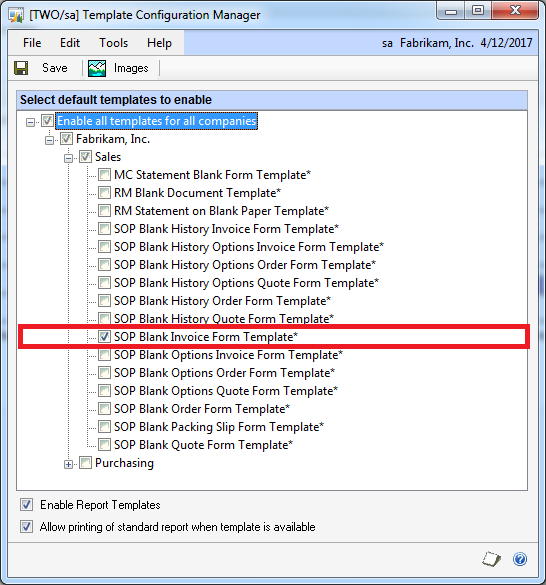 [NOTE: If you are working with a modified version of the SOP Blank Invoice Form created in Report Writer and exposed to Word Templates, then choose Modified from the Status drop-down list. 3. Click the New button on the Report Template Maintenance window to create a new template based on the existing one. 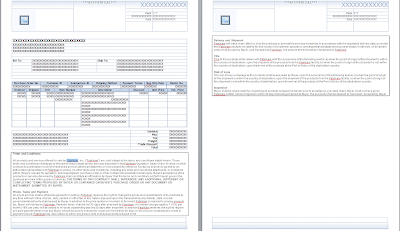 For this example, we will call this template SOP Blank Invoice Form with Conditions. Click the Create button when finished. 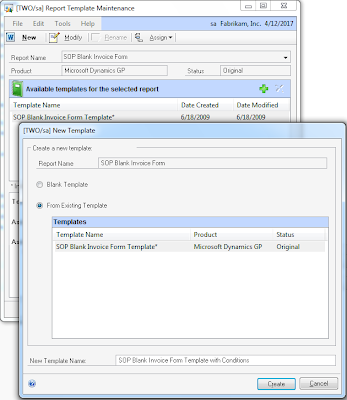 You should now see the new template version in the Available Templates pane in the Report Template Maintenance window. 4. 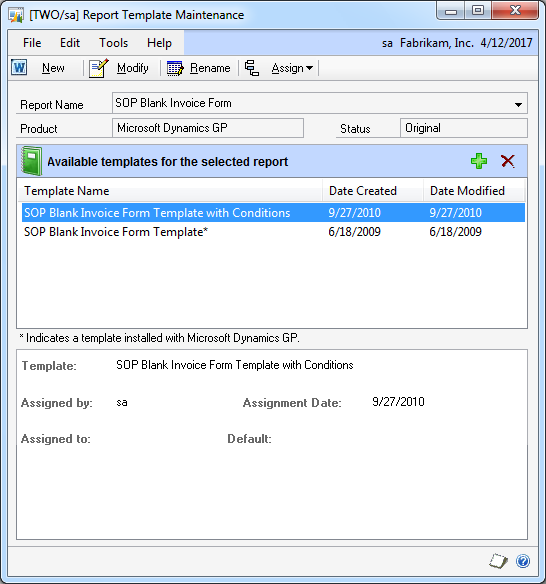 Click on the Modify button to open the SOP Blank Invoice Form Template with Conditions template in Microsoft Word. 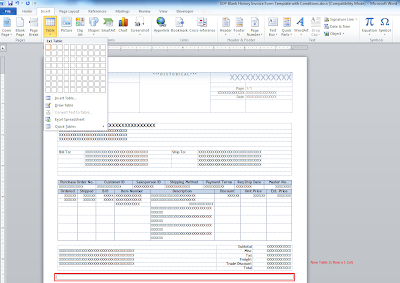 Position the cursor beneat the Total field and insert a 1 row by 1 column table. Add the Terms and Conditions text inside the table as shown below. 5. Highlight the newly added table and its text, then click on the Paragraph expansion button under the Home ribbon to open the options window. Click on the Line and Page Breaks tab and mark the Keep Lines Together and Page Breaks Before check marks. Click Ok to continue. Note that the table has now moved to a second page. 6. Save the modified Word template in your My Documents folder to avoid loosing your changes when you close Word then reimport the template in the Report Template Maintenance window. Assign the template to the company and make it the Default template. NOTE: You can also choose to assign the template to specific customers if needed, however, for demo purposes, we are choosing to default the template. 7. 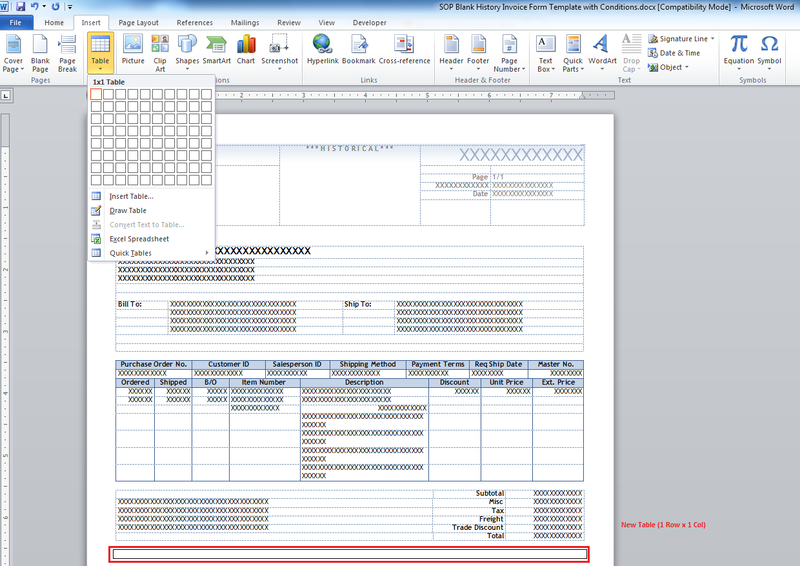 Print a SOP invoice choosing the Blank form to ensure the template prints as expected. NOTE: At the end of this article I realized I had modified the SOP Blank History Invoice Form Template. Print a historical invoice instead as the results should be the same. Is there a way to do something similar to this but have a cover letter? 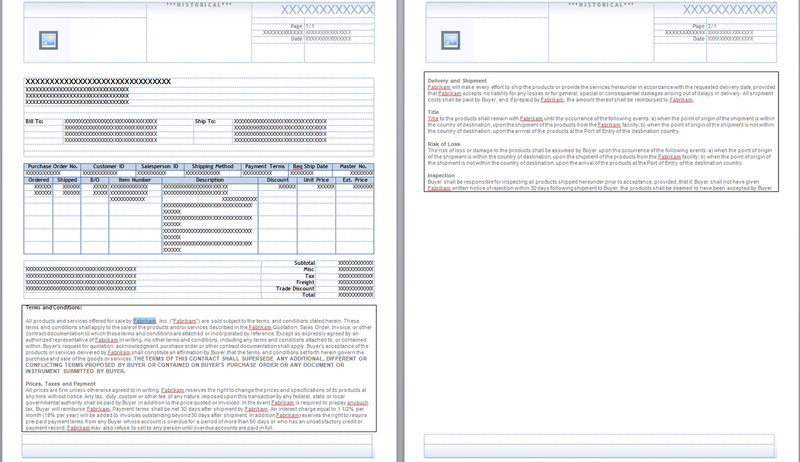 So basically - first page is cover letter - all words - next page is the invoice. I am close to one but the repeating section is giving me a headache and half. This is great, thank you. But is there a way to suppress the Document Header on the T&C pages? Not sure, but this would have to come from Report Writer directly. You would then recreate the report definition and add your T&C. Anyway to print the terms/conditions on the back of each page? @Anonymous: basically, your question comes down to how to collate a fix content page every odd page in Word (double-sided printing is a function of the printer). Frankly, I don't know how you would do this and suggest you check on the Microsoft Word forums. There are a number of Microsoft Word MVPs who are willing to help on those forums. Is it possible to fix the page numbering at the top. I noticed you have the same issue I do - page 2/1. I tried entering a new page number field and when I print a batch, it numbers all the pages. I am not sure how to fix this. Is there a way to turn off the header and footer on the terms and conditions page? 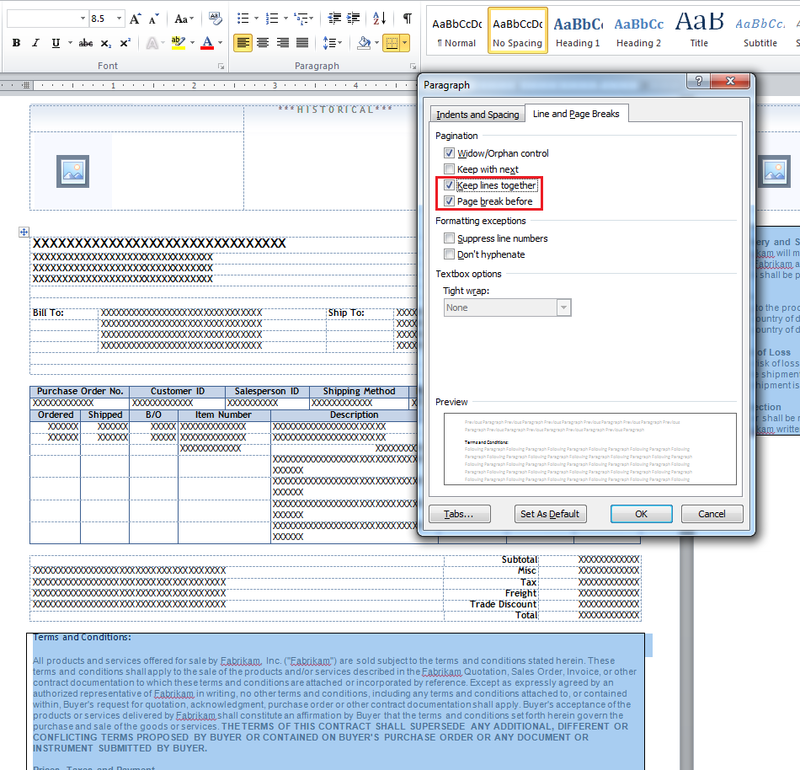 I've tried turning it off in the Word document and although it appears to work when I run the template from GP the header and footer are turned off for all pages. Your posts have been very helpful, thank you. 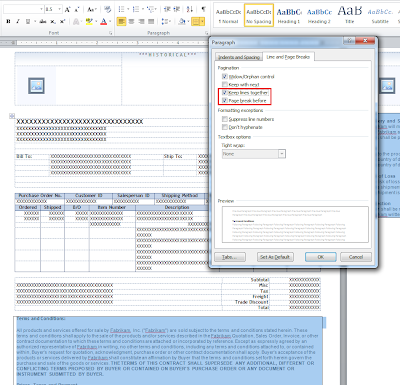 Is it possible to add the T&C by itself fix to the last page in Report Writer for “POP Purchase Order Blank Form"? The Dynamics GP Blogster changes its motto!